We Spring Ahead this Sunday, March 11th at 2:00am (officially). This is a great time to Spring clean! EscrowOne, Inc. would like to share their tips with you. Start with organizing, then share, clean and replace. Go through closets, drawers, cupboards and simply declutter counters, shelves and tables. This is always something we need to force ourselves to do, but we are always so exhilarated with the end results. Share any unused or un-needed items with Goodwill or a charity local and dear to you. Items we haven’t removed from our closet can greatly help someone of need. A good rule of thumb is, if it has not been used in the last 6 months, then you do not need it. It’s time to Clean-Clean-Clean! Start from the top to the bottom. Deep clean lights, ceiling fans, walls, doors and door casings, windows, and base boards. This is a good time to clean under and behind appliances too. You may find that sock you’ve been hunting for! Once that is complete, and it may take a few days, our carpets and floors are usually in need of Spring Cleaning as well. Now, it is time to replace smoke and Carbon monoxide detector batteries, air filters, air fresheners and batteries in any remotes and clocks as we are changing the time one hour forward. It is always best to task Spring Cleaning among the family. Be careful to not physically over do it and always be safe on ladders and with lifting. It may be best to divide you cleaning up over a few days or spread over a couple of weekends. This should complete the cleaning and make your home most enjoyable with a refreshing and relaxing environment. 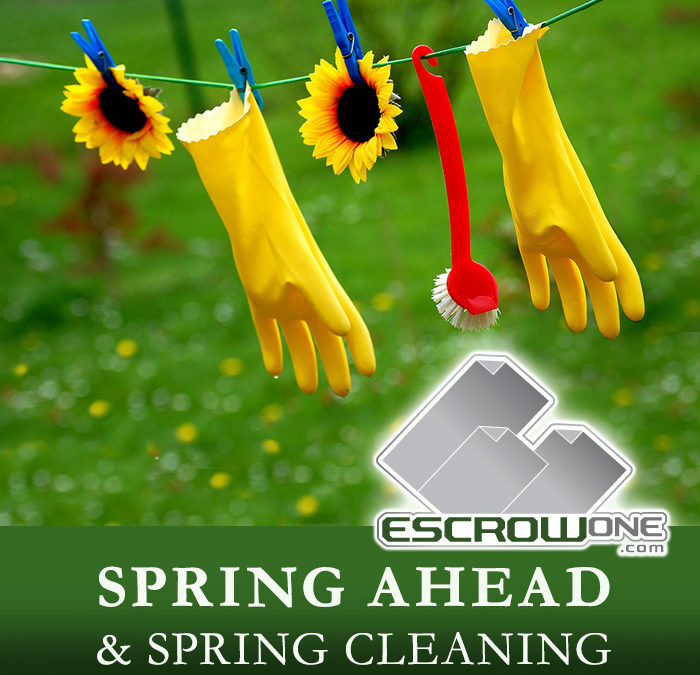 EscrowOne, Inc. would like you to enjoy your clean and organized home during this Spring and Summer season.